I opened the program and clicked on the menu option to save a bmp to the desktop. No issues for me to save the .bmp graph to my desktop. Vista 32 here. It's kinda random (uninitialised variables I guess?) - oh and I hadn't loaded a file. This looks like an x-axis scaling problem too. I think the buttons should be swapped out for checkboxes with standard text to the right of them. To the left of the checkbox could be another little square with the appropriate colour in it (or something along those lines anyway). That way, it'll all theme properly once the XP manifest is added. The checkboxes can be disabled when that data isn't available in the IBG file. CD-ROM, CD-R, CD-RW - 1.125GB full scale / 125MB increments. DVD-ROM, DVD-R, DVD+R, DVD-RAM - 4.5GB full scale / 500MB increments. DVD-R DL, DVD+R DL - 9.0GB full scale / 1GB increments. HD DVD-ROM, HD DVD-R, HD DVD-RW, HD DVD-RAM - 18.0 GB full scale / 2GB increments. BD-ROM, BD-R, BD-RE - 27.0GB full scale / 3GB increments. You didn't mention DL HD DVD or DL BD media as types that ImgBurn would report in the .ibg files. Should I add these media types as well ? I am saving the plots as a .png now. Let me know if I corrected the "save" problem and if I am only capturing BurnPlot instead of the whole desktop. @ Everyone - Try it out and let me know how it works. When I select the 'Open ImgBurn Graph File' option - I do have 1777 graph files saved in that folder - but it will only show 6 files from the folder and they show up in a random way (not the latest or oldest). Edit: I see the issue. 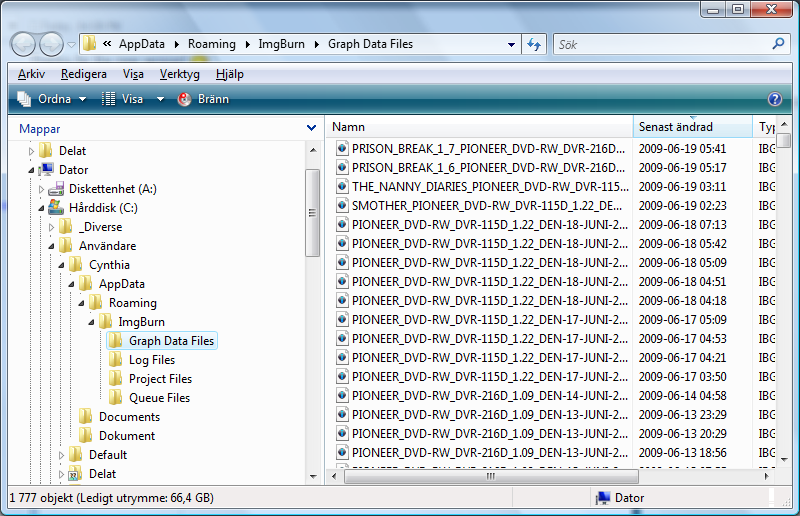 The program is picking the graph file folder of the currently logged in user. Couldn't it pick the same folder as you have set as save folder for the graph files in the ImgBurn settings? I think some of the options rows are tricky to see - especially the blue one. Perhaps a scheme like this - and eventually when the option is disabled - let the text fade out/grey out a bit. 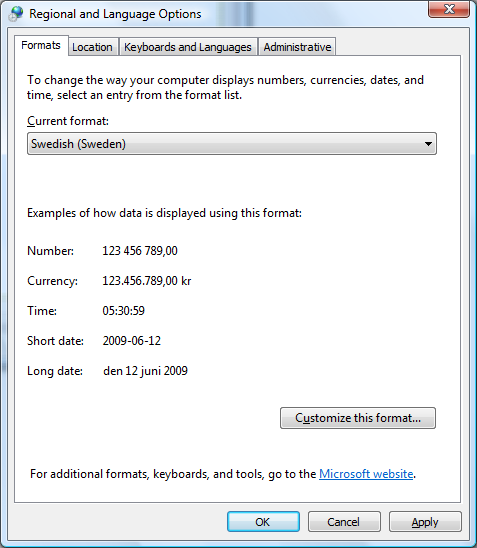 Would it be possible to show the local formatting (as they are set up in the Windows settings) of dates? @ Cynthia - I think I have addressed all of your issues except for date/time formatting. I display the information as read from the .ibg files. If local formatting is something that DVDInfoPro does then I will look into it. @ LIGHTNING UK! - I cheated and added the manifest file to the compiled .exe with Resource Hacker. @ Everyone - I think the program only has a couple of thousand problems now. Let me know how it looks. If local formatting is something that DVDInfoPro does then I will look into it. If the IBG's formatting changed depending on who created them, you wouldn't be able to look at other peoples with different formatting (or at least it would be more difficult). For that reason, everything is written with UK (and US I guess) formatting and the conversion is done at the displaying tool's end. As an idea, could you change 'Raw Data' / 'Average Data' to a couple of radio boxes? It looks a bit odd when 'Raw Data' is unchecked and yet that's the one that's valid. where O is the radio button and  is the combobox. 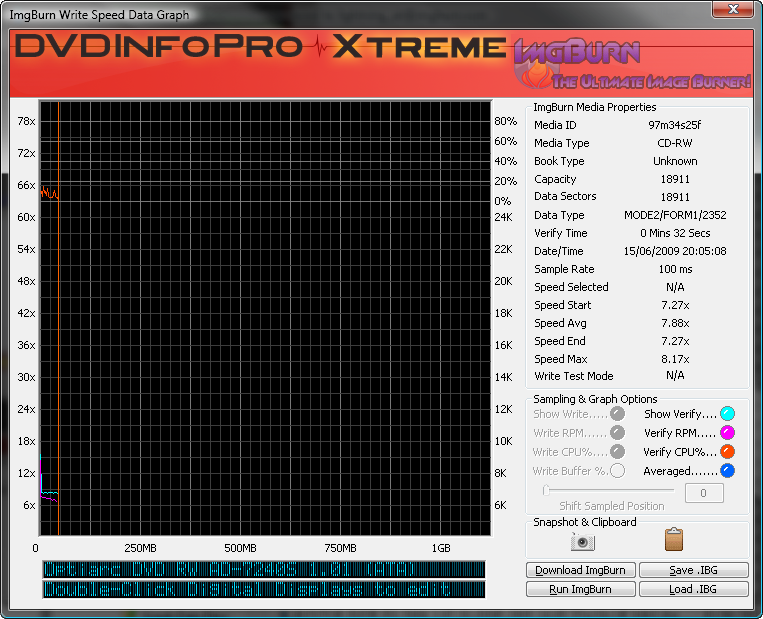 I'm not sure you need the 'shown' / 'hidden' text next to the comboboxes of the graph lines. Can you get the 'Save' function working with a dialog box too rather than always saying to the desktop? Oh and rather than using a menu in the way you are, use a toolbar instead (with images). A menu should have the drop downs, yours goes against how every other program functions and doesn't work how a typical user would expect it to. It's that or put 'Open Graph File...' (or 'Open IBG File...') and 'Save Screenshot...' under a 'File' menu. 'About' is typically under a 'Help' menu. I fully agree. The new design of the plot boxes looks good! Do yo have any plans to add support for local language files? Like if there is a text file in the same folder as the program - it will use the translated text strings in the program. That would be a nice thing for non English users. instead of --> Application Data\ImgBurn\Graph Data Files ? 1.) Use localized settings for .ibg date and time data formatting. 2.) Changed 'Raw Data' / 'Average Data' selection to radio boxes. 3.) Removed 'Shown' / 'Hidden' / 'No Data' text from plot selection descriptions. 5.) Standardized drop down menu selections. I think I see light at the end of the tunnel but I am not sure. Take it out for a spin and let me know how it works. Looks good my end although I'm not convinced you're getting the 32bit 16x16 icon in the taskbar or top left corner of the app window... it looks more like the 4bit colour one. DVD-ROM can be SL or DL (there is no distinction between the two - the same is true for BD-ROM, BD-R and BD-RE), this means your scale will need to be adjusted based on 'MEDIA_CAPACITY' and/or 'MEDIA_LAYER_BREAK' ('MEDIA_LAYER_BREAK' isn't used/valid for BD media). Can you plot another red virtical line if 'MEDIA_LAYER_BREAK' is present/valid in the IBG? The RPM lines aren't right for a DL read (haven't checked burn) yet... or in general (when compared to DVDInfoPro) if I'm honest (yours seem to curve?!). You really should ask over at cdfreaks for help with that, I'm sure someone will know how to do it and will have used it in their own project somewhere. If your lines aren't right, it's probably better they're not there at all... I can't say that I pay any attempt to RPM anyway and would probably survive without them until a fool proof solution has been found. If you made the window a bit wider, do you think you could put the info onto 1 line rather than 2? Then you'd have room for all the stuff you've missed off (when compared to DVDInfoPro's viewer - things like speed start/end/avg/max etc). How useful is the 'Raw' setting btw? for me it just produces an ugly solid/thick block line! I guess that's why DIP has the 'Shift Sampled Position' slider. So if you've got 18 lines/samples in the IBG for every 1 pixel on your graph, you can slide through all 18 to see the different lines the data will draw. Other than that, there's definitely light! If you go to File -> Save BurnPlot Screen Capture it saves the screenshot even if you click Cancel/the X button/hit ESC on keyboard. 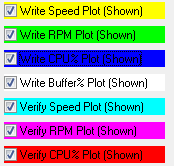 This happens on Windows 7 x86 RC1 build 7100 (can't test other OSs right now ). Is it supposed to save its settings at the moment? Like if I set the 'Averaged' value to something, will it remember it between closing and reopening the program? Works 100% in XP SP3! It's saving the screenshot regardless of if the users cancels the save box or not (GetSaveFileName returns 'false'). @ LIGHTNING UK! & mmalves - I found three bugs in my Open/Save file routine (One you already know about) after posting the previous version of BurnPlot. I fixed them and attached the new version. @ LIGHTNING UK! - Not sure about the icon - I am using an icon with 4 sizes at three different color depths. I'll look into it. I can change the UI any way you like but I was trying to avoid creating a DVDInfoPro look-a-like and only included the information I felt necessary. Do you want me to present everything DVDInfoPro does ? Currently not saving any settings. Will look into writing them to the registry. If the write speed line is a curve, the rpm is normally straight and vice-versa. That's the whole CLV/CAV thing.